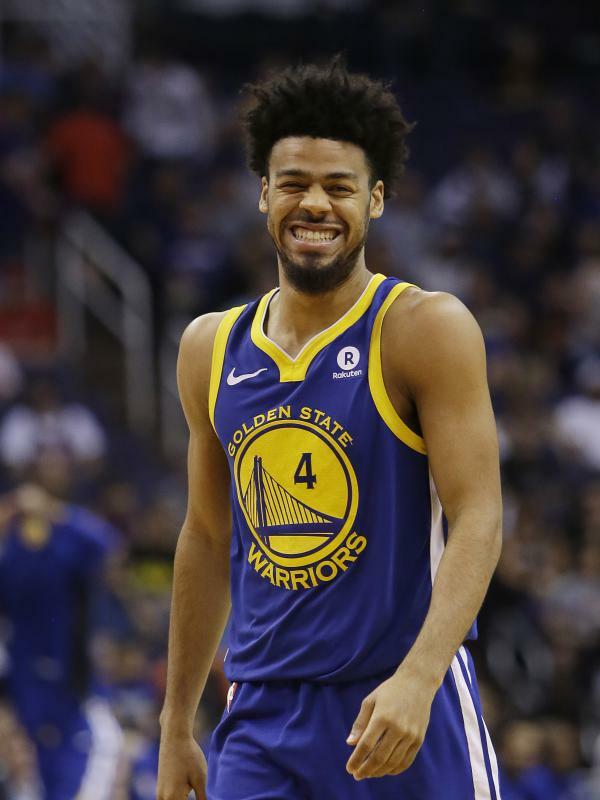 Golden State Warriors guard Quinn Cook in the second half during an NBA basketball game against the Phoenix Suns on April 8, 2018, in Phoenix. Cook started his basketball career in Ohio, where Game 3 of the NBA Finals happens on Wednesday. Quinn doing interviews during Media Day before the NBA Finals began at the Warriors' home court, Oracle Arena, in Oakland, Calif. The NBA Finals are in Cleveland for Wednesday's Game 3 and the Warriors lead the series 2-0. For Cook, it's a homecoming of sorts because he started his professional career in Ohio. It was a start he never imagined. A star in college, Cook had to grind through pro basketball's minor leagues. Now, suddenly, he's on the brink of winning an NBA title. Two years ago, on the NPR podcast Embedded, we described how Cook helped Duke win the NCAA men's Division 1 basketball title in 2015, and then a few months later, he gathered with friends and family to watch the NBA draft. But Cook didn't get picked, and the hoped-for celebration didn't happen. "I thanked everybody who came [to the draft watch party], about 20 people that came," Cook told NPR. "My mom knew I was about to break down. [I] went outside, broke down in my brother's car. It was painful." Three of his fellow Duke teammates were drafted in the first round. Cook headed for the Canton Charge of the D League. Now it's called the G League. It's the NBA's minor league, where talented but not-ready-for-primetime basketball players go, hoping it's a step to the NBA. Early on in the season, Cook said he resented having to go the D League route. But he learned to embrace it and was named Rookie of the Year. Despite his success, Cook still didn't get a coveted call-up to the NBA. "It's been the story of my whole life," he told NPR in 2016. "[Maybe] it's just my size or, I don't know. I was just always overlooked growing up. Y'know that's what my agent was telling me, I mean, you've had this happen before. You just got to go to work and show everybody that you belong in the NBA." After a second successful D League season, in which Cook was named Most Valuable Player in the D League All Star game, he stutter-stepped his way toward the NBA. He was signed and cut by New Orleans, Dallas, New Orleans again and Atlanta. Then last October, Cook signed what's called a two-way contract with Golden State. The contract tied him exclusively to the Warriors G League team, in Santa Cruz, Calif., while allowing a limited number of appearances with the NBA club. But when Golden State's superstar guard Steph Curry was injured late in the regular season, Cook's appearances became frequent. Basketball underlings are told to make the most of their minutes, when they get them. Cook certainly did that during his big chance with the Warriors. He scored in double figures 14 straight games right before the 2018 playoffs began. "I think he's a really good backup point guard," Golden State head coach Steve Kerr said during Cook's breakout moment. "He's a long-term NBA player in my book." On April 10, Cook took a big step toward long term. He signed a two-year contract with the Warriors. The Warriors assembled for Media Day before the Finals, and Cook handled his duties like a veteran – whether it was recording a promo for the Cartoon Network, or joking with Guillermo from Jimmy Kimmel Live! Still, he admits having "pinch me" moments about where his journey has led. "As soon as we won [the Western Conference Finals which put Golden State in the championship series], we started walking to the locker room and I broke down a little bit," Cook says. "And then just coming in here today, [you see] the NBA Finals logo everywhere and it hit me then like 'wow' this is really the NBA Finals. "I could tell you who's been in the NBA Finals since 1989, '90, probably," Cook continues. "To be here it's a dream come true. But I just don't want to be here. I want to win. [My teammates] want to win another championship." And despite the tearful draft night three years ago, and the roller-coaster ride since then, Cook says he's glad it went the way it did. "I'm happy y'know I had to wait that long and really push myself even harder," Cook says. "I knew there would be a time, like I told you, y'know back then, that I had to wait my turn, it wasn't my turn yet and I finally got the right opportunity, the right situation, I took full advantage, and just being here on this team, just learning so much from these guys. You can do nothing but get better." Cook's post-season learning curve has been steep at times. In the Western Conference finals against Houston, Cook missed a potential game winning shot at a crucial moment, in what turned out to be a Golden State loss. In the first two games of the Finals, he's played a total of three minutes. But you have a sense if there are more opportunities — to play and to make an impact — he'll be prepared. Because Quinn Cook is nothing, if not ready. The NBA Finals have shifted to Cleveland for tonight's Game 3 between the Cavaliers and the Golden State Warriors. Golden State leads two games to none. For Warriors reserve guard Quinn Cook, it's a homecoming of sorts. He started his professional career in Ohio. It was a start he never imagined. He was a star in college. He had to grind through pro basketball's minor league. And now he's on the brink of winning an NBA title. NPR's Tom Goldman reports. TOM GOLDMAN, BYLINE: With a few minutes left in Game 2 of the finals the other night, something unremarkable happened. GOLDMAN: Golden State's Quinn Cook scored. The game already was decided. The bench players were on the court - unremarkable. 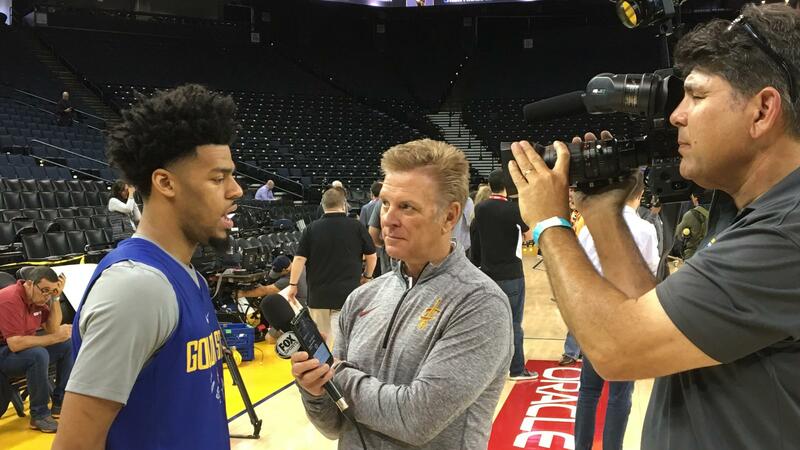 Yet Quinn Cook wearing a Warrior's uniform playing and scoring in the NBA Finals - kind of amazing for those who'd followed his story, which we did two years ago on the NPR podcast Embedded. KELLY MCEVERS, BYLINE: So for the 2015 draft, there's this player named Quinn Cook. And he's sure he's going to get called in the second round. GOLDMAN: Embedded host Kelly McEvers described how Cook helped Duke win the NCAA title. And then a couple of months later, he held a watch party for the NBA draft. But he didn't get picked, and the hope for celebration didn't happen. QUINN COOK: I thanked everybody who came - about 20 people that came. And my mom knew I was about to break down. I went outside, broke down in my brother's car. And it was painful. GOLDMAN: Three of his fellow Duke teammates were drafted in the first round. Cook headed for the Canton Charge, a team in the NBA's minor league. It's where talented but not-ready-for-primetime players go hoping it's a step to the NBA. My NPR colleague Uri Berliner and I followed the Charge and Cook for an entire season. Early on, Cook said he resented having to go this route. But he learned to embrace it and was named rookie of the year. In our final interview from that 2016 season, Cook reflected on his success and the fact that it still didn't lead to a coveted NBA call-up. COOK: It's been the story of my whole life. It's just my size or - I don't know. I just always was overlooked growing up. You know, that's what my agent was telling me. I mean, you've had this happen before. You've just got to go to work and show everybody that you belong in the NBA. GOLDMAN: After a second successful minor league season, Cook stutter-stepped his way toward the NBA, signed and cut by New Orleans, Dallas, New Orleans again, Atlanta. Then last October, he signed a contract with Golden State that tied him exclusively to the Warriors' minor league team while allowing a limited number of appearances with the NBA club. But when Golden State superstar guard Steph Curry was injured late in the regular season, Cook's appearances became frequent. UNIDENTIFIED SPORTSCASTER: Quinn Cook continues his fine play with a new career high - 30 for Quinn Cook. GOLDMAN: Basketball underlings are told to make the most of their minutes when they get them. Cook scored in double figures 14 straight games right before the playoffs. It prompted this from head coach Steve Kerr. STEVE KERR: He's a guy. He's an NBA guy. So we're lucky to have him. GOLDMAN: The proof came in April when the Warriors signed Cook to a two-year contract. GOLDMAN: Good to see you. COOK: Good to see you as well. GOLDMAN: I meet with Cook for the first time since 2016 on NBA Finals Media Day where he's handling his duties like a veteran. UNIDENTIFIED PERSON: Come on; just give me a on your Cartoon Network. COOK: On your Cartoon Network. UNIDENTIFIED PERSON: Awesome. Thanks, man. GOLDMAN: As seasoned as he sounds, Cook admits he's still having pinch-me moments. COOK: You know, I can tell you who's been in the NBA Finals since '89, probably, '90. So to be here, it's a dream come true. But, you know, I just don't want to be here. I want to win. GOLDMAN: And despite the tearful draft night three years ago and the roller coaster ride since then, Cook says actually he's glad it went the way it did. COOK: I'm happy, you know, I had to wait that long and really, you know, push myself even harder. You know, I knew there would be a time like I told you, you know, back then that I just had to wait my turn. It wasn't my turn yet. And, you know, I finally got, you know, the right opportunity, the right situation. I took full advantage. And just being here on this team, just learning so much from these guys, you can do nothing but get better. GOLDMAN: The postseason learning curve has been steep at times. In the Western Conference Finals against Houston, Cook missed a potential game-winning shot at a crucial moment in what turned out to be a Golden State loss. In the finals, he's played a total of three minutes in two games. But you have a sense if there are more opportunities to play and to make an impact, he'll be prepared because Quinn Cook is nothing if not ready. Tom Goldman, NPR News. Transcript provided by NPR, Copyright NPR.